"It's really amazing that they're considering someone for Secretary of State who has millions invested in these companies," said environmental leader and 350.org founder, Bill McKibben. Please tell me we can do better! It so sad Obama couldn't get the correct "Rice" . All the Politicians have oil reserves in their pockets. It was only an election ploy, when Obama put off the the building of the northern half of the XL pipe-line. Big oil & gas control this country, or should I say, "Greed!" The Pres. I voted for 2ce has put us in the position of having to disagree with both his nominees now. 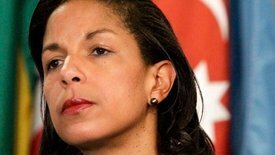 If Rice is discounted, the next person is John Kerry. If Kerry leaves the Senate, the seat that Elizabeth Warren fought so hard to win against Scott Brown will again be up for grabs. Guess who will have the most momentum in taking that seat. Why were Progressives put in such a defensive position? Outrageous. If she gets nominated and approved (unlikely) she should probably sell it. But then again, how many other politicians hold stock? Are they required to sell theirs? Don't think it makes that much difference either way as they all vote their pocketbooks. Scumbags. Thanks Joanne, hopefully people are paying attention. At least as of an hour ago she had not been nominated so I'm guessing either this will not be needed, or else there will be new petitions on respectable sites.